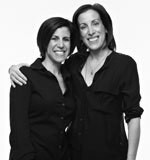 What’s chock full of protein and won’t make a big dent in your grocery budget? 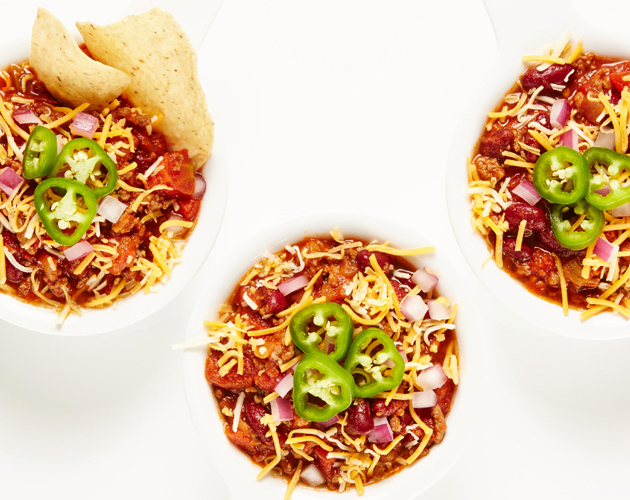 Ground beef, and here, we’ve rounded up seven easy and tasty ways to cook with it. Jumping on the chuck wagon? Check out this video on how to make the perfect burger. 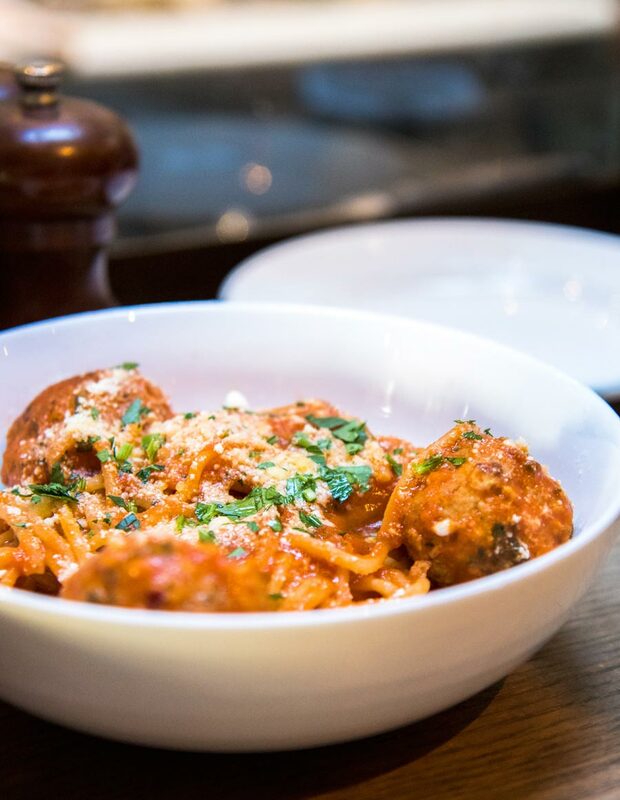 How do you turn tender meatballs into great balls of fire? Simple…just stop, drop and roll. As in, stop what you’re doing, drop the grocery bags and start rolling out these marvellous homemade meatballs. Paired with this robust and spicy spaghetti sauce, this easy dinner is going to get everyone fired up! 1) For the tomato sauce, in a large saucepan, heat 1 tablespoon of olive oil over medium-low heat. Add onion and cook for 3 minutes, until softened. Add tomato paste, garlic and crushed red pepper flakes and cook just until fragrant, about 1 minute more. Add tomatoes, breaking them up with a wooden spoon to create smaller chunks. Once sauce comes to a boil, reduce heat to a low simmer. Add basil, salt and pepper and let simmer for 20 minutes. Remove basil and set sauce aside until meatballs are ready. 2) For the meatballs, in a large bowl, combine panko crumbs, parmesan cheese, ricotta cheese, eggs, basil, parsley, garlic, salt and pepper. Mix well to combine. Add ground beef and veal, mixing thoroughly by hand until well combined. Shape into 2-inch meatballs. 3) In a large skillet, heat 1 cup olive oil over medium-high heat. Brown meatballs in batches, being sure not to overcrowd the pan, about 4-5 minutes per side until both sides are browned. Remove from pan and drain on paper towel. Place meatballs into simmering tomato sauce and cook covered for 15-20 minutes more. 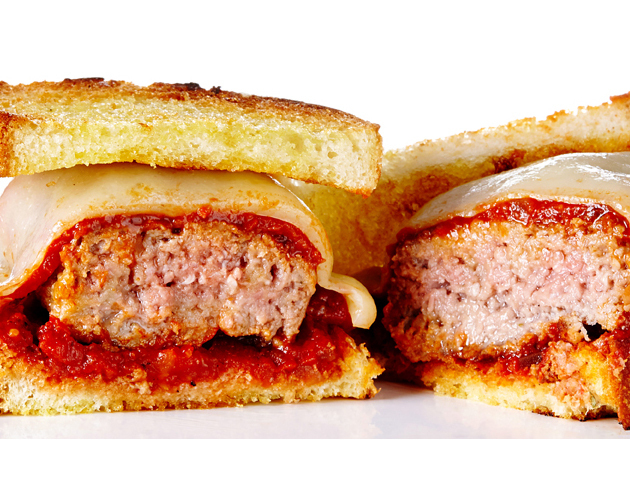 What do you get when you cross a burger, meatball and grilled cheese sandwich? Why, a delicious and satisfying Meatball Patty Melt, of course. Shaped into a patty, meatballs are cooked up on a griddle and nestled between slices of crisp garlic bread, homemade balsamic tomato sauce and gooey provolone cheese. To say that this sandwich is flavorful wouldn’t be doing it justice – every bite is an explosion of deliciousness. 1) For the tomato sauce, in a large saucepan, heat the olive oil over medium heat. Add onions and garlic, stirring frequently until softened, about 2-3 minutes. Add red wine and cook, stirring until almost completely absorbed, 1-2 minutes. Add tomatoes and break up with a wooden spoon to create small chunks. Season with salt, pepper and sugar and bring to a boil over medium heat. Reduce heat to low and simmer for 10 minutes, stirring occasionally. Add balsamic vinegar and basil, continuing to simmer 5 minutes more. Remove from heat and set aside. 2) For the meatball patties, in a large bowl, combine ground beef and veal. Add panko breadcrumbs, Parmesan cheese, eggs, parsley, oregano, garlic, salt and pepper. Mix to combine all ingredients. Add water and mix until incorporated. Shape meat mixture into 8 patties roughly the size of your bread slices. 3) Spread garlic butter over bread slices, on both sides. Toast both sides on a griddle over medium-low heat, until golden. Set aside. 4) Preheat broiler to high. 5) Place flat bottom griddle over medium-high heat and generously sprinkle with kosher salt. This will help create a nice crust on your patty. Grill patties until cooked to desired doneness, about 3 ½ minutes per side depending on thickness. 6) To assemble, place 2 tbsp of tomato sauce on a slice of garlic toast. Place patty over the sauce and add 2 tbsp more tomato sauce. Place a slice of cheese over the sauce and place under the broiler to melt the cheese. Watch carefully because it will burn quickly. Top with another garlic bread slice and serve immediately. Repeat with remaining sandwiches. 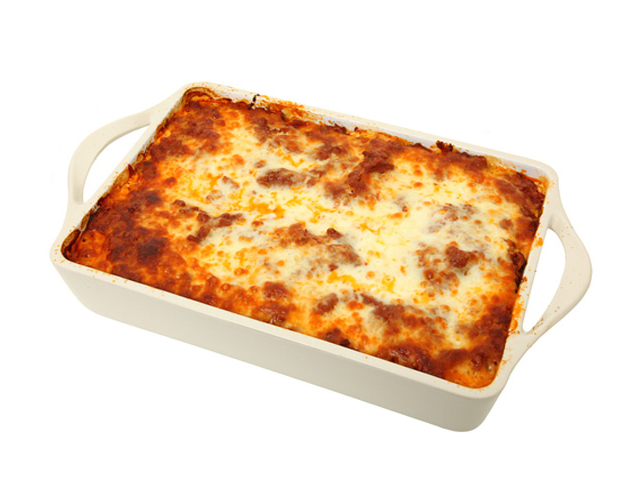 This deep dish meat lasagna is perfection – not only is it layers of soft noodles, hearty meat sauce and melted cheese, but it’a also a crowd-pleasing comfort food that’s both quick and easy to make. 1) Preheat oven to 375°F. Coat a 13×9-inch baking dish with non-stick cooking spray. 2) For the sauce, in a large skillet, brown beef over medium-high heat. Drain and return to pan, adding diced tomatoes with their juice, tomato paste, brown sugar, basil, salt and oregano. Bring to a boil and then turn down to low, simmering for 30 minutes. 3) For the cheese filling, in a medium bowl, whisk eggs, ricotta, Parmesan, basil and salt. 4) To assemble, spread 1 cup of meat sauce in the prepared dish. Top with 4 noodles, 1/2 of the ricotta mixture, 11/2 cups mozzarella and 1 cup meat sauce. Top with 4 more noodles, remaining ricotta and remaining mozzarella. Place 4 remaining noodles on top, cover with remaining meat sauce and sprinkle with Parmesan cheese. Bake uncovered for 35 minutes. 1) In a large soup pot, heat olive oil over medium heat. Add onions and stir often, cooking 4 minutes. Add diced red pepper, garlic, chili powder, cumin, paprika, cocoa powder, salt, oregano, red pepper flakes, brown sugar, black pepper and cayenne pepper. Cook for 1 minute to combine spices, stirring continuously. Add the ground beef and cook 10 minutes until no longer pink. Break beef up with a wooden spoon as it cooks. Add diced tomatoes, tomato paste, beef broth and cider vinegar. Bring to a boil over high heat. Reduce heat to low, cover and simmer 45 minutes, stirring occasionally. Add kidney beans and simmer uncovered for 15 minutes more. 2) Serve topped with sour cream, cheddar on Monterey Jack cheese, sliced jalapeño and/or fried tortilla strips (cut corn tortillas into thin strips, fry in 1-inch of oil for 1-2 minutes and season with a little salt). While we never tire of spaghetti (yes, we’re carbaholics), we do like to change things up a bit, especially with this Parmesan Polenta. Topped with our homemade rich and robust Bolognese sauce, cheesy polenta never tasted so great! 1) Coat an 11×7-inch baking dish with non-stick cooking spray. In a large pot, bring 5 cups of water and 1 teaspoon of salt to a boil over high heat. Reduce heat to low and slowly add the cornmeal, stirring constantly with a wooden spoon, about 10 minutes. The mixture should be thick and smooth. 2) Remove from heat, stir in 1/4 cup Parmesan cheese and spoon into prepared baking dish. Set aside. 1) For the sauce, in a large skillet, sauté ground beef over medium-high heat, breaking it up as it cooks. Cook for 5 minutes, or until it is no longer pink. Drain in colander and return beef to skillet. 2) Add milk to skillet and cook over medium heat for 3 minutes, until milk is absorbed. Add mushrooms, carrot, onion, garlic, basil, oregano, salt and pepper. Cook over medium-low heat for 8 minutes, until the onion is softened. 3) Add tomato sauce, red wine and Parmesan rind to the meat mixture. Bring to a boil, reduce heat to low and simmer partially covered for 30 minutes. Remove from heat and discard Parmesan rind. 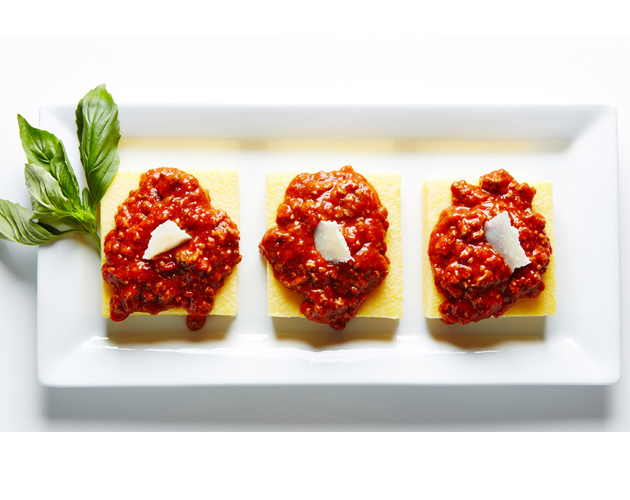 4) For serving, slice polenta into 6-8 servings and spoon Bolognese sauce over each portion. Finish with freshly grated Parmesan cheese. Can’t you just hear Elvis strumming a uke? See Harry Truman sporting an Aloha shirt? 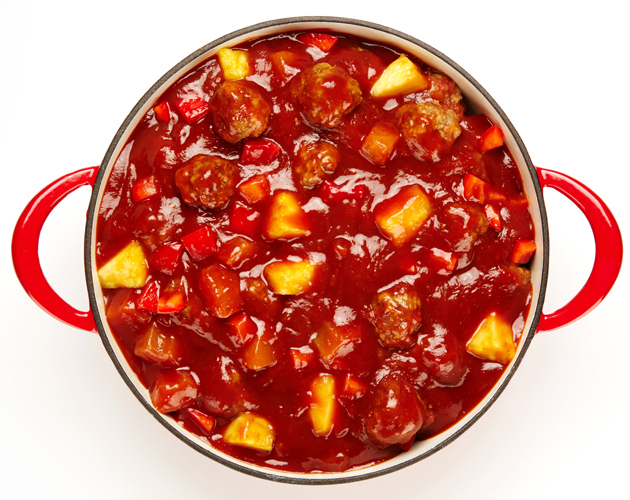 Well, now you can taste some Polynesian paradise in these sweet and sour pineapple meatballs. Rock-a-hula Baby and get rolling on these supremely saucy, tender spheres best piled atop a Mauna-kea (white mountain) of rice. 1) For the meatballs, preheat oven to 500°F. Line a large baking sheet with aluminum foil and coat with non-stick cooking spray. 2) In a large bowl, mix the ground beef, breadcrumbs, milk, eggs, salt and pepper until combined. Add 2 handfuls of very cold water to the bowl and mix until combined. Shape the beef mixture into 1-inch meatballs. Place in a single layer on the prepared baking sheet and bake 12-15 minutes. Remove from oven and drain on paper towel. 3) For the sauce, in a large saucepan, combine pineapple chunks (with syrup), chili sauce, red peppers, soy sauce, vinegar and brown sugar. Place cornstarch in a small dish, stir in 1 cup of water until smooth and add to saucepan. Bring to a boil over medium heat, continuously stirring until sauce thickens. Gently stir meatballs into sauce, cooking until heated through.